After last week's match against Académica, this was a good opportunity to see how well Olhanense would fare in their home turf against stronger opposition and, on the other hand, to analyse FC Porto in further detail. Even though this was not a match awash with scoring opportunities, it was highly entertaining and the Northerners were lucky to get away with the three points. The Portuguese champions got off to a good start and seemed willing to pick up where they had left off, in the back of their comprehensive win versus Vitória de Guimarães. In fact, Vítor Pereira's men were much better at pressuring high up the field, with everyone on the same page about when and where to exert pressure. Offensively, they were clearly taking advantage of what had been easily perceivable as Olhanense's weak link: Babanco. Therefore, FC Porto insisted on the right wing for the first 15 minutes, with Lucho, Danilo and Hulk eager to capitalise on their opponent's weakness. 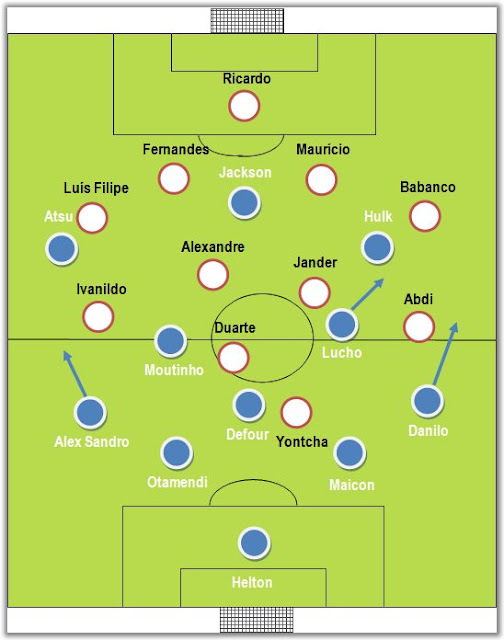 Sérgio Conceição's men, in turn, seemed a bit confused and lost until they were finally able to execute a well-thought counter-attack and pounce on Alex Sandro's ill-timed foray (a usual trait in South American full-backs). This play just served to further expose Defour's inadequacy for the holding midfielder position, showing Fernando's critical role in the team. After the goal, the team from the Algarve looked more comfortable on the ball and FC Porto became both disjointed defensively and restless on the ball, turning too slow and predictable, apparently afraid to expose themselves to any more counter-attacks. Vítor Pereira decided he couldn't wait any longer and replaced the ineffective Atsu with James and the Colombian forward immediately shook things up by teeing up Moutinho for a good opportunity and placing a wonderful lob over Ricardo, misjudging once again his opportunity to punch the ball. The Dragons came on strong for the second half and Jackson hit the woodwork and scored his second league goal following James' delightful assist. From then on, it was hard to see how the home team would manage to get around FC Porto's defensive organisation, despite obvious leaks that it will be urgent to address. The game went on without much to report (besides Vítor Pereira moving James into Lucho's position and possibly hinting at his preferences as far as James' position is concerned), until Hulk unleashed a powerful shot into the roof of the net to top it off. The match seemed all but over, but Targino's goal following another excellent assist, this time by Rui Duarte, opened it up and the away team ended up suffering needlessly to get away with the win. In short, FC Porto were a dominant force after James coming on, but they would be well advised to improve their defensive consistency as quickly as possible. As for Olhanense, they showed once again sound defensive positioning, but they still seem to lack out-balls and the ability to take control of the match. Besides, Rui Duarte seemed once again out of his depth by playing too high up the field. A simple tweak from Sérgio Conceição may mean a more balanced and dangerous team.